I am running the Cortana beta iOS TestFlight app, and I’m not yet seeing the option in any of my other Cortana endpoints. 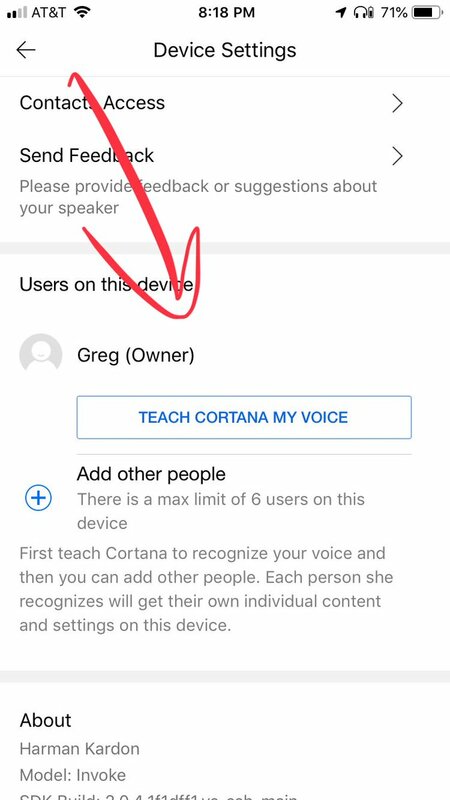 Also, when I tried to run through the TEACH CORTANA MY VOICE setup process, it told me to ask my speaker, “Cortana, learn my voice,” but both of my Invoke speakers just responded – repeatedly – with a digest of a Windows Central article explaning how to teach Cortana your voice…on the PC. Yeah. Not a great first experience. I’m supposing it’s just not fully baked yet. Still, it’s promising, and from the look of the page in the app, you’ll be able to have up to 6 distinct users configured per device. For me, that would immediately make the Invoke about 100% more useful. I can’t wait to try it out.